Not quite a Yoga. 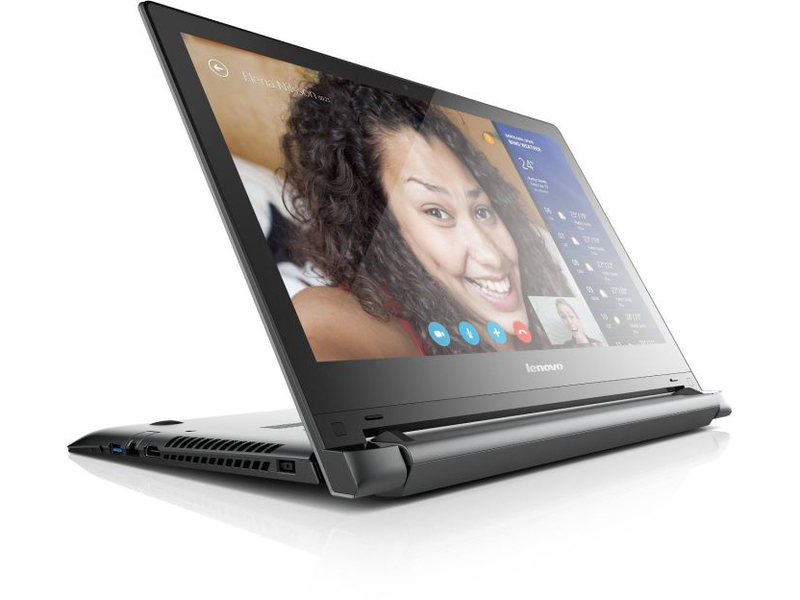 Lenovo's Yoga devices offer four modes, the Lenovo Flex 2 14 just two. 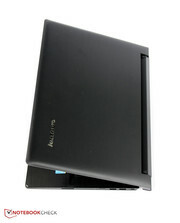 So it is the right choice for anybody who is looking for a flexible notebook, but not a tablet. Our review shows why there is an update not even one year after the IdeaPad Flex 14, where the differences are to the Yoga 2 13 and who could be interested in the Flex 2 14. Last November we reviewed the Lenovo IdeaPad Flex 14, and it was a decent device for consumers, only the low resolution was a drawback. Lenovo reacted, removed the IdeaPad from the designation and equipped the successor Flex 2 14 with a Full HD display. Is the new device a whole new generation or just a remake with some improved details? What are the changes and where are the differences to the more flexible Yoga 2 13? Our review will give the answers. 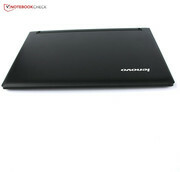 Suitable comparison devices are the Toshiba Satellite W30t as well as the Asus Transformer Book TF300LA. The Acer Aspire R7-571G is a bit bigger and more expensive. You can also try the Asus VivoBook S451LB if you don't need a foldable screen. 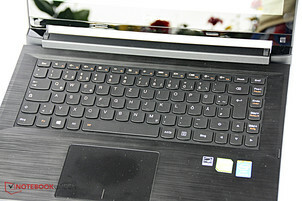 The keyboard is surrounded by plastic with a brushed aluminum look. The Flex 2 14 is not yet listed on Lenovo's German website, but the American website advertises a wide range of colors for the convertible. However, the pictures only show models in black or silver-gray with a black cover. There is no sign of the orange color version that was still available for the predecessor. Our review sample is the completely black version. 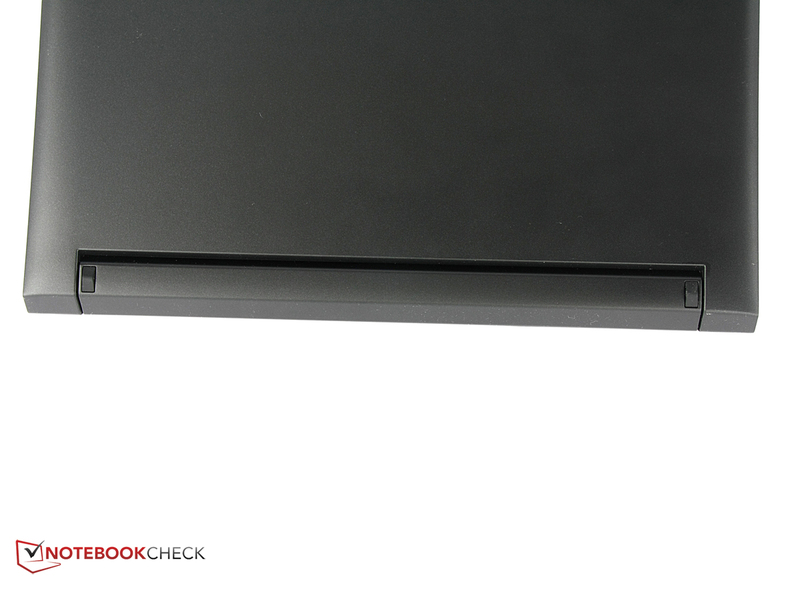 The main difference to the Lenovo IdeaPad Flex 14 is the side view, more precisely the location of the ports and the standby button. 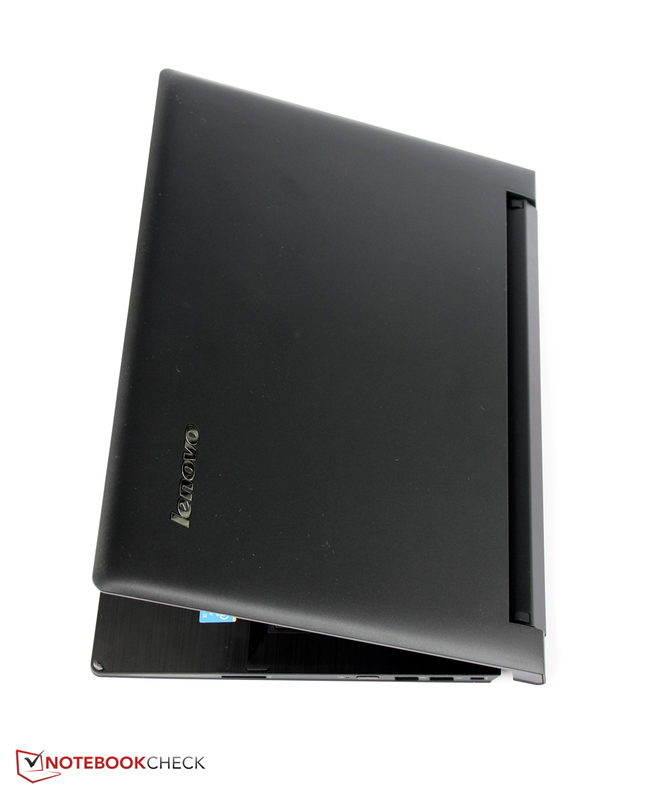 Shutting down the laptop is a tricky issue with Windows 8 anyway; Lenovo was heavily criticized for the unusual location of the standby button on the IdeaPad Yoga. 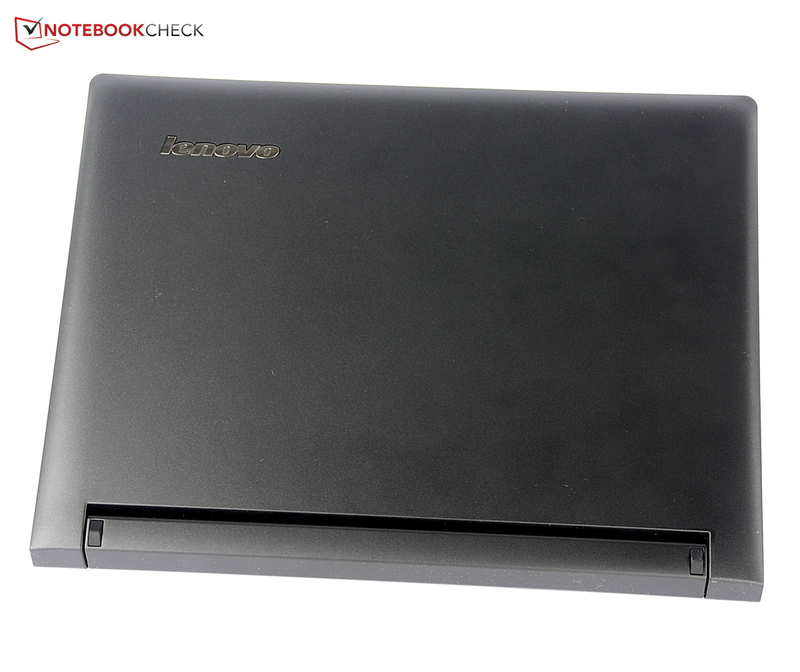 The Lenovo IdeaPad Flex 14 had a more sophisticated layout with the power button at the right rear, where you would expect it at a second look. Now it is further at the front where you wouldn't expect it, but it is pretty easy to find after a little while. Plastic is the material of choice, you don't get any metal in the case for 599 Euros (~$803) . At least the palm rest looks like metal with a brushed finish. Overall, the surfaces feel good and sophisticated, but the quality impression is affected by a metallic sound when you press down the case or the keyboard with average force. 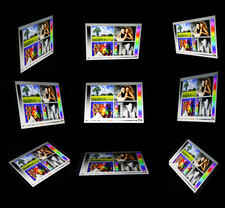 Pressure on the display, or slight twisting, also results in picture distortions. However, you can only twist the lid; the base unit is very sturdy. 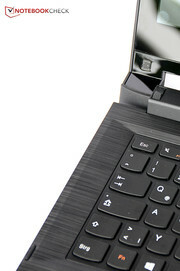 The main differentiator of the Lenovo Flex-series and the reason why we classify it as a convertible is the hinge, which can be opened by around 300 degrees. This means you can use the convertible in a Stand-mode, which is already familiar from the Lenovo Yoga: Just fold the display back and place the device on the keyboard. The Tent-mode from the Yoga is also possible in theory, even though Lenovo doesn't advertise it: The Flex 2 14 is placed on the edges, the keyboard is folded back and supports the touchscreen, which can be operated very comfortably. The main reason for this is the higher resistance and that the display, contrary to the laptop mode, cannot be pushed back. This mode is certainly a useful extension for touchscreen fans. All in all, the case just slightly changed compared to the IdeaPad Flex 14 and leaves a mixed quality impression: While we like the surfaces despite the plastic, we are not convinced by the stability, especially of the display. The ports have been completely rearranged, but the number and variety of ports did not really change compared to the IdeaPad Flex 14: There is still just one USB 3.0 port, two USB 2.0 ports are on the right side. The only new feature is the possibility to use a notebook lock. 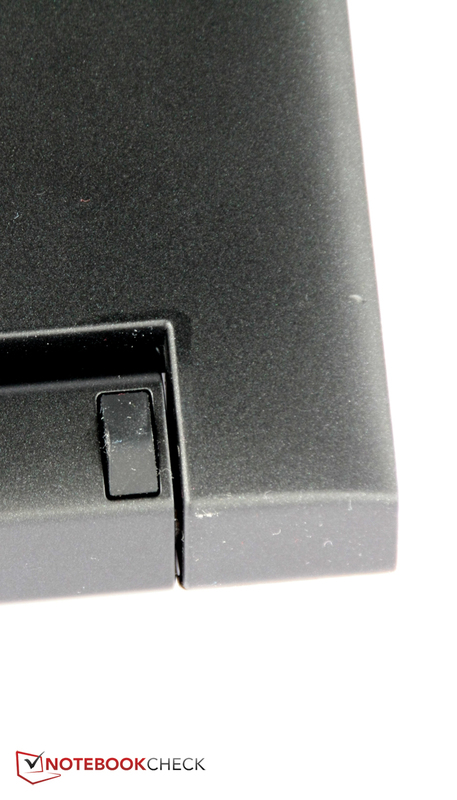 However, Lenovo waived the volume rocker on the right side completely. It is still great that we get an Ethernet port, which even supports Gigabit networks. A 720p webcam is integrated above the display. The quality is sufficient for video calls, but recorded videos show issues with the color reproduction and low-light performance, which means you cannot really use it for other purposes. Lenovo is not very generous in regard to the WLAN and integrates a module which supports wireless networks with the standard up to 802.11 n. Fast wireless networks with the latest 802.11 ac standard are not supported, but the n-standard is usually sufficient for private use right now. The signal quality is okay, Windows indicates 3/5 up to 4/5 bars with a distance of 10 meters from the router and through three walls (individual set-up of the author). Webpages also load pretty quickly. Another two meters and another wall result in 1/5 or 2/5 bars, not the best results we ever measured. It takes perceptibly longer before webpages are loaded with this distance from the router. 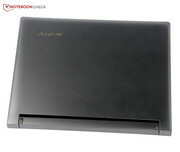 You can find a service manual on the Internet that describes the maintenance of the Lenovo Flex 2 14. It is actually not that easy to access the components because you have to remove the keyboard first. You also have to remove the connector of the keyboard, which is not really recommended for inexperienced users. After that you have to loosen several screws before you can lift the bottom cover and then remove the battery, which is once again not that easy. 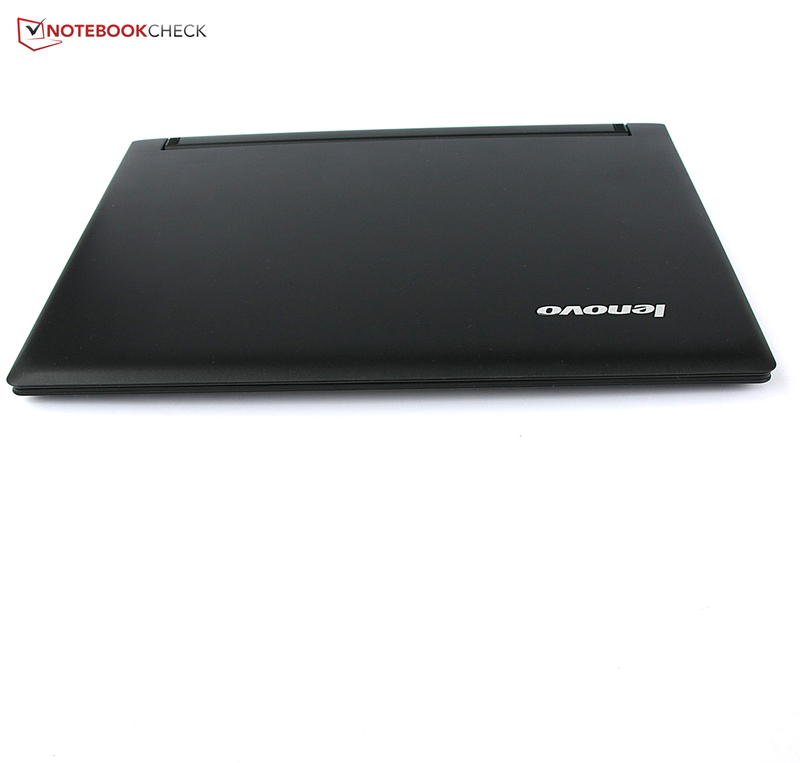 The maintenance of the Lenovo Flex 2 14 is therefore for more experienced users or real professionals. You should not try it if you have never disassembled a notebook before. 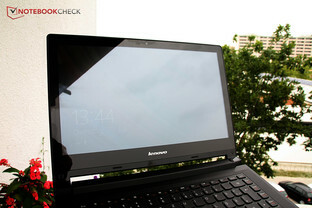 Lenovo only grants a warranty of 12 months for the devices of the Flex-series. You will have to pay more if you want to extend the service, at least 22.61 Euros (~$30) for a two-year standard warranty. The three-year warranty with accidental protection is the maximum option and costs 103.53 Euros (~$138). The AccuType keyboard looks completely similar to the keyboard of the IdeaPad Flex, the Yoga 2 13 or the Yoga 2 Pro. It is also very close to these models in terms of typing experience: The stroke is pretty soft and there is hardly any resistance. The travel is pretty limited and the overall feedback a bit weak. However, based on our experience, you can work with the keyboard very well, especially since the nicely designed keys are pretty high and wide with 14 millimeters. The layout is intuitive and the special functions on the keys F1 to F12 are numerous and useful. The keyboard illumination can be activated with the key combination Fn + Spacebar, and the brightness can be adjusted in two steps. However, the keys are also pretty easy to see in the twilight thanks to the black surface with white lettering. The touchpad is a ClickPad, which means that there are no dedicated mouse buttons, but the whole bottom part of the ClickPad can be pressed to execute a left or right click, respectively. The button areas are a part of the touch-sensitive surface, so ClickPads are cheaper for the manufacturers because they don't have to integrate dedicated buttons. However, this also results in a less precise handling that we have described several times: Clicking the pad also leads to an additional contact, which can influence the movement of the cursor. 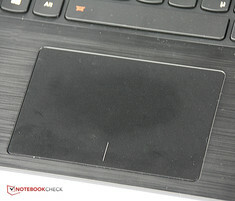 Some ClickPads also don't have a clear separation for left or right clicks, respectively. 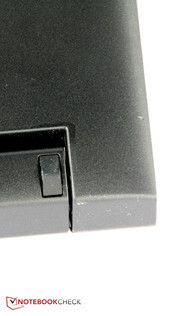 A center mouse button or a scroll function, which is offered by some high-quality touchpads, is not available either. 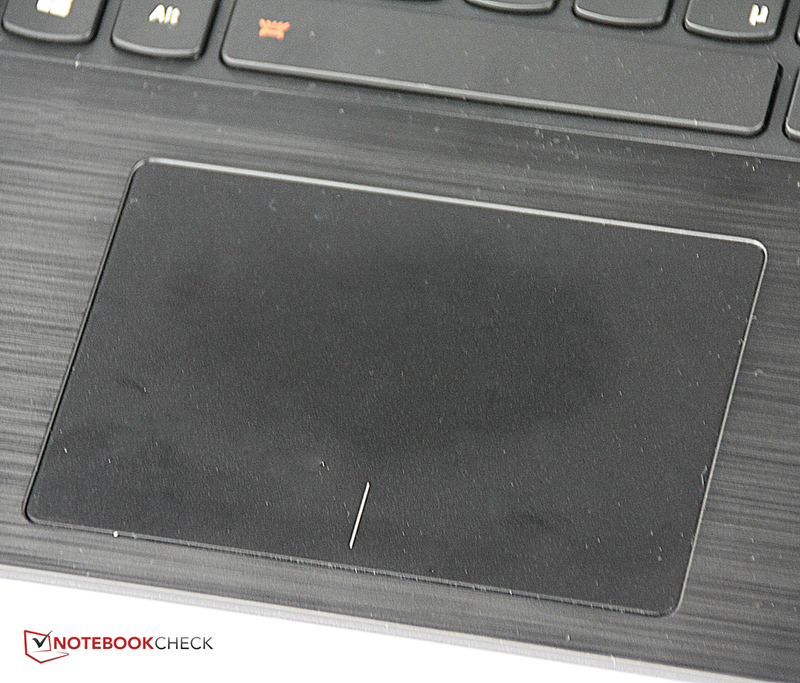 The ClickPad of the Lenovo Flex 2 14 shows some of these drawbacks as well: Drag-&-Drop usually works pretty well, but the cursor sometimes doesn't know which finger on the touchpad it should follow. The two clicking areas are only separated by a stripe, but you cannot feel any separation with your fingers. So there can be some wrong inputs from time to time. The travel during clicking is also pretty limited and the feedback could be improved. At least multi-touch gestures like scrolling on websites work reliably. The surface also offers decent gliding capabilities and the size of the ClickPad is good as well with a diameter of 12.5 centimeters. The touchscreen surface also convinces us with good gliding capabilities and the ability to recognize inputs from up to ten fingers simultaneously. Multi-touch gestures like zooming or scrolling are obviously supported as well and work pretty well. The firm hinges also allow the use of the touchscreen in laptop mode, but that does mean the Tent-mode is a bit superfluous: Why should you turn the convertible around if it also works this way? The touchscreen itself is also sensitive and exact in the peripheral areas. We could not determine any delays with inputs, the so-called touchscreen lag, either. A big difference to the IdeaPad Flex 14 is the much higher display resolution of 1920x1080 pixels, which can even keep up with much more expensive rivals like the Acer Aspire R7-571G or the Asus Transformer Book T300LA. The Acer Aspire R7-571G clearly has an advantage in terms of brightness with 286.7 cd/m²; our review sample only manages 215.3 cd/m². However, the other comparison devices and the predecessor are roughly on the same level compared to our review unit. The brightness distribution is pretty even with 88%, and you cannot see any brightness differences with the human eye, even with large colored areas. Lenovo once again uses an IPS display with a Pentile-RGBW matrix. A white sub-pixel is added to the red, green and blue pixels, which usually create the picture, but the number of sub-pixels is still lower compared to usual RGB screens. 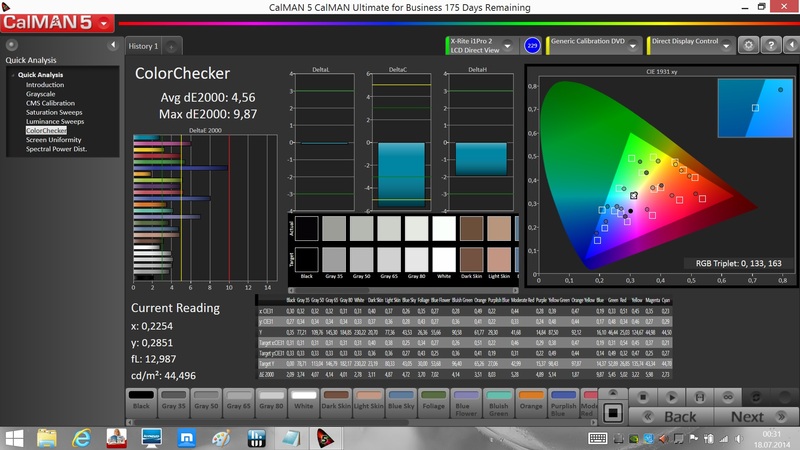 An integrated engine recalculates the pictures to ensure a good picture quality and accurate colors. Because of the lower density of sub-pixels and the recalculation of the pictures that are produced by the GPU, the sharpness can be reduced, which is clearly visible in some applications. 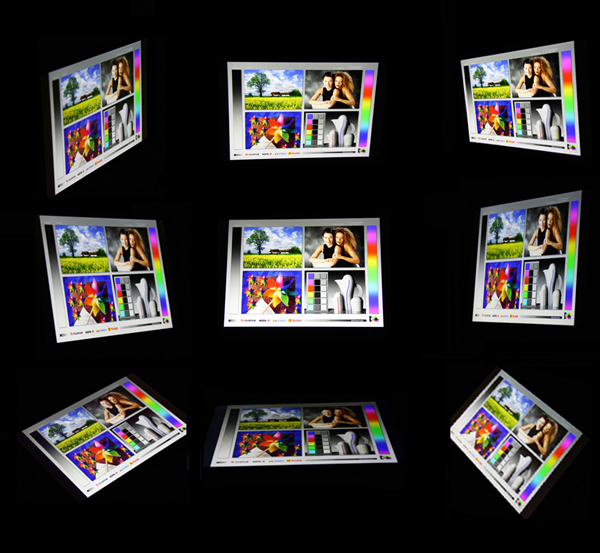 Pentile displays have the advantage of cheaper manufacturing, and they also consume slightly less energy, because the background illumination can be dimmed for many colors thanks to the white sub-pixel. 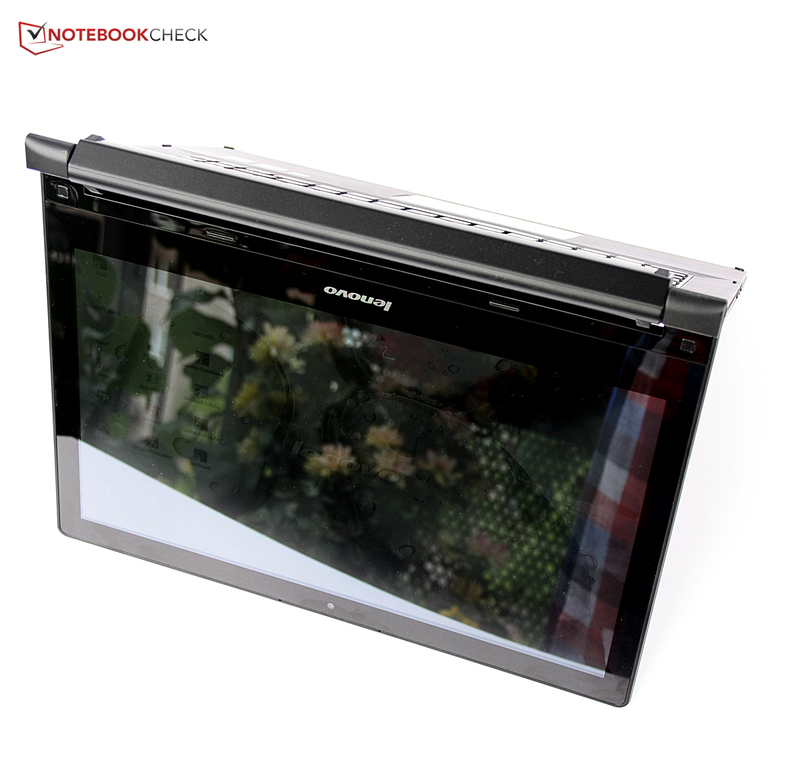 The reduced sharpness was clearly visible in some applications in the case of the Yoga 2 13, which uses a pentile display as well. Unfortunately, the same unwanted effects of the technology also affect our review sample in some scenarios. The colors of the display are also a bit too pale and too cool, which indicates too much blue in the colors. The black value of 0.21 cd/m², however, is fortunately pretty low, which results in a very decent contrast ratio of 1029:1. Neither the predecessor nor the majority of rivals can keep up with these results. 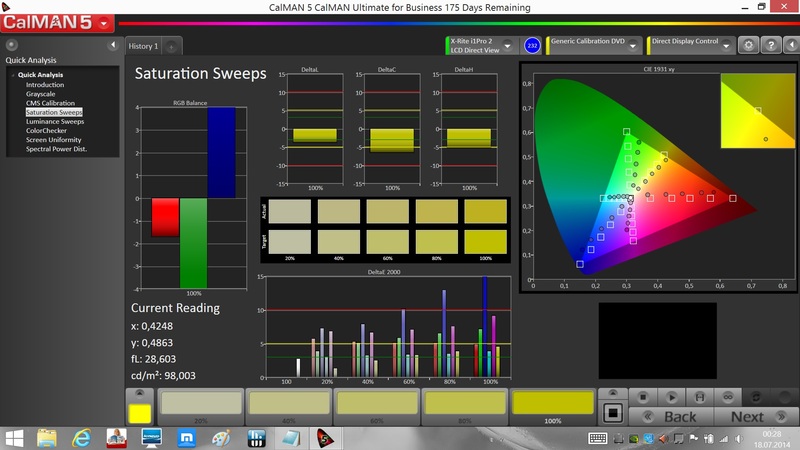 We performed a more detailed analysis with our measurement devices and CalMAN software. We can see a surprisingly small deviation from the ideal value of the reference color space sRGB, and even the blue cast is not as strong as feared. 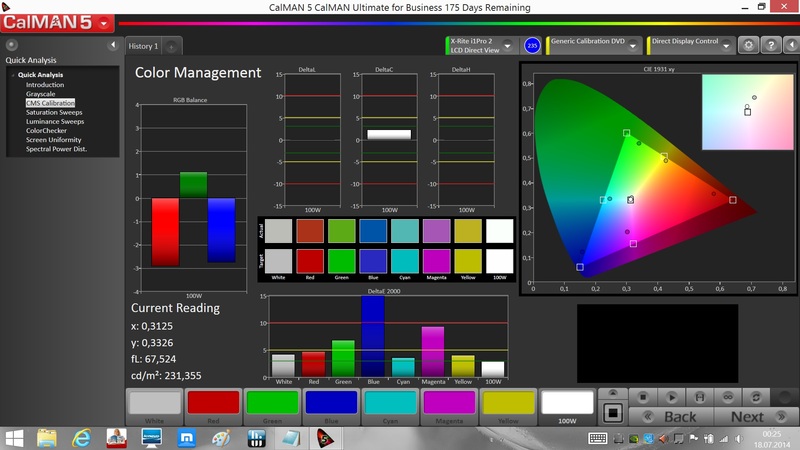 In this case it is true that IPS displays offer more accurate colors than inexpensive TN LED displays. Overall, the blue colors have the largest deviation, and the saturation is increased. Our impression that the colors are too pale compared to the ideal value is confirmed as well. The display is not suited for professional users with coverage of only 53% RGB and 37% AdobeRGB. All in all, the display offers a decent native resolution this time. The issue with the reduced sharpness of the pentile display, however, is not very convenient and could scare off some potential buyers. 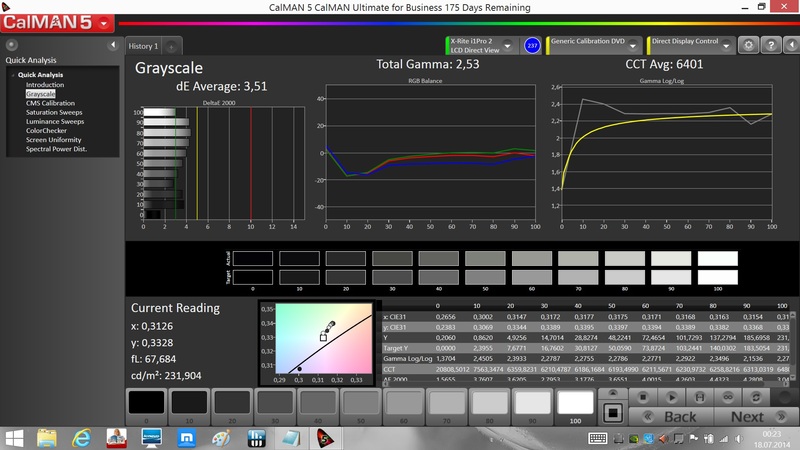 The overall color representation is not accurate enough and too pale, but acceptable for a consumer device. Outdoors you get problems with the very glossy surface of the touchscreen and the low average brightness of the panel. Working in bright environments is an issue, because there will be reflections almost all the time, so it is pretty tiring for the eyes to focus on the display content. There are also issues with reflections in bright indoor environments or in the shade. The viewing-angle stability of IPS displays is usually very good, but you can see a pretty severe brightness decrease that results in a much darker picture when you turn the Lenovo Flex 2 14 to the left or right by more than 30 degrees. However, vertical changes are no problem; the brightness remains stable even with very flat viewing angles. 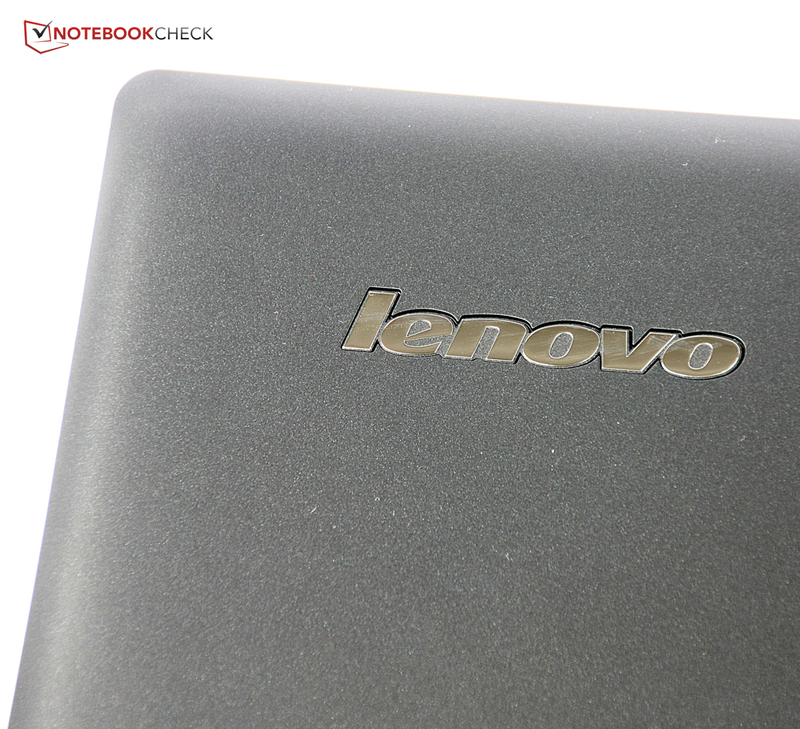 How much performance does the Lenovo Flex 2 14 offer? An interesting question since you get an SSD and a dedicated GPU for the comparatively low price. The amount of memory has been reduced to 4096 MB compared to the predecessor and the processor is only an Intel Core i3-4010U, which does not offer all the features of the Core i5 inside the IdeaPad Flex 14. We still expect a decent office performance and we can maybe even play some games with the dedicated GPU. The IdeaPad Flex 14 used an Intel Core i5-4200U clocked at 1.6 GHz, the Flex 2 14 is equipped with a Core i3-4010U running at 1.7 GHz (probably to keep the price down, despite the dedicated GPU). The main difference is not the clock, but the supported features, where the Core i5 has an advantage over the Core i3. Both processors support Hyper-Threading, which means the two cores can execute up to four tasks simultaneously. 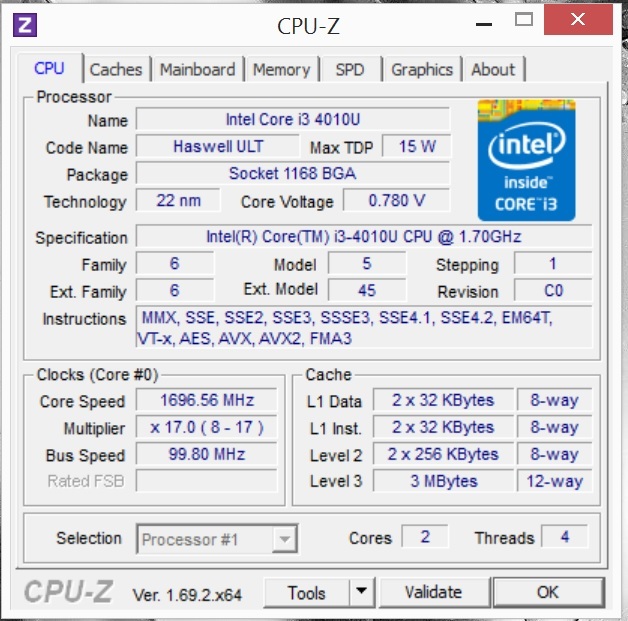 However, the Core i3-4010U has no Turbo Boost: While the Intel Core i5-4200U runs with up to 2.6 GHz, the Core i3-4010U stays at up to 1.7 GHz all the time. This results in a performance disadvantage of up to 35%, or even almost 50% if you use one core, in the synthetic benchmarks of the Cinebench-series. This is perceptible in practice when you navigate the OS, but with more demanding calculations in particular, for example, picture or video editing. 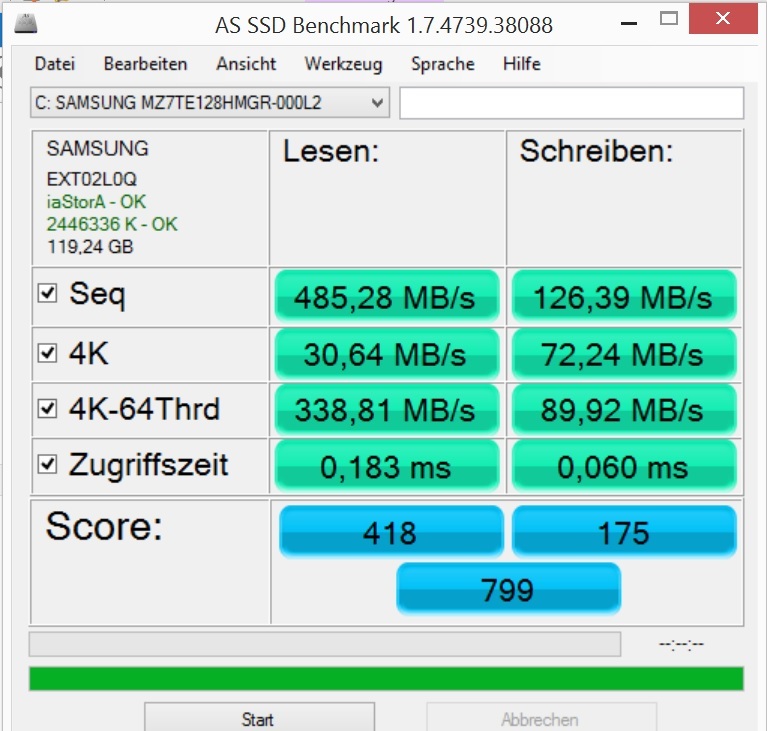 That the lower performance is not such an evident problem is a result of the SSD. The comparison of the system performance with the PCMark-series shows that the dedicated graphics card in particular is the big difference to the other systems: PCMark 8 shows a very big difference in the Creative test because it benefits from more GPU performance. Other devices like the Toshiba Satellite W30t fall behind because of their conventional hard drives. This means you can expect more performance from the Lenovo Flex 2 14 compared to the rivals when you use GPU-demanding applications. Another performance advantage is the SSD, even though you can only use a capacity of around 100 GB in return. The slow processor prevents even better results. The comparison with the Lenovo Yoga 2 13 quickly shows that a conventional hard drive cannot keep up with the SSD inside the Lenovo Flex 2 14 in terms of transfer rates and access times. We already mentioned that you have to live with significantly less capacity in return. The larger amount of system memory and the faster processor of the IdeaPad Flex 14 enable slightly better results and the SSD inside the Asus Transformer Book T300LA is significantly faster. The most interesting topic in the Performance section is certainly the dedicated graphics card: The Lenovo Flex 2 14 is equipped with an Nvidia GeForce 840M that has 2048 MB dedicated memory and a core clock of 1,028 MHz. 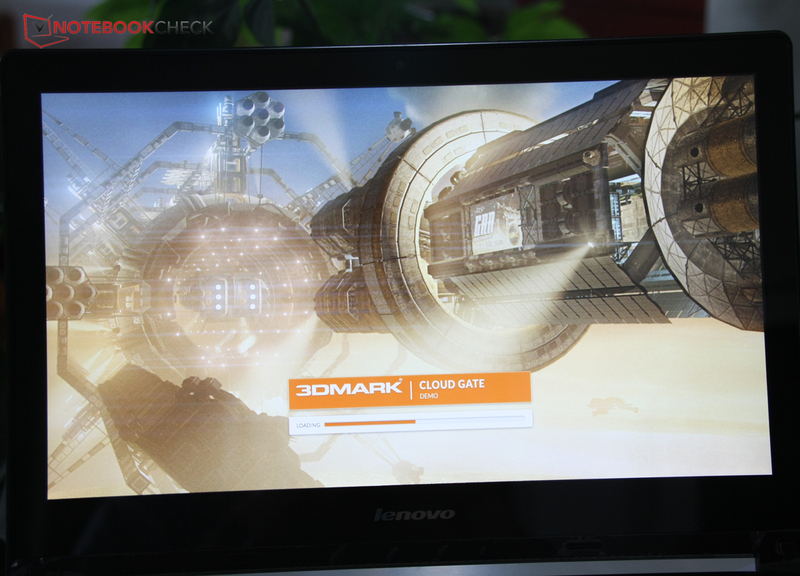 The 3DMarks show that the mainstream GPU is between 20% and 60% faster than the integrated Intel HD Graphics 4400 and Radeon HD 8210 in the Lenovo IdeaPad Flex 14D, respectively. The Flex 2 14 can also use the Intel HD Graphics 4400, for example, for simple tasks because it consumes less power. The notebook supports the automatic GPU switching via Nvidia Optimus technology. Only the Acer Aspire R7-571G and the Asus VivoBook S451LB also use a dedicated GPU within the comparison. Acer's device is clearly ahead with its GeForce GT 750M. The Asus VivoBook S451LB uses a GeForce GT 740M from the last generation, which is a bit slower than the GeForce 840M. All in all, the Lenovo Flex 2 14 offers quite a lot of GPU performance within the comparison, which expands the usage scenarios. But is decent gaming possible? We will check that in the next section. You can play games with the Lenovo Flex 2 14 and the quality is not even bad in some cases: Older or less demanding current titles run smoothly with medium settings. However, you cannot use the native display resolution most of the time. This results in a problem: Some games show strange behavior. Thief, for instance, only lets you change the resolution when you leave the game; this was not the case for any of our other review units. Tomb Raider does not scale lower resolutions to the full display size. The same applies for Anno 2070, even though the full-screen option is activated. But the mouse overlay does, so there are issues when you play the game. We suspect that this is a result of the new calculation of the picture from the GPU by the display controller. We could launch Diablo III and also heard the audio, but the display just did not want to show a picture. The game ran after we switched to the Intel HD Graphics 4400, but the performance was obviously worse. There are also picture errors: Shifted lines appear that look as if they would be from a larger-scaled picture. However, this last issue could be solved with an update to Nvidia's latest reference driver. The GeForce 840M is at the bottom in terms of performance: The majority of comparison devices with the same GPU usually manage a couple of frames more. This is most likely a result of the pretty slow processor, which restricts the performance of the mainstream GPU. The Flex 2 14 is, fortunately, pretty restrained in terms of system noise: The fan is often completely deactivated during idle. It only starts running if the applications get more demanding. The result is a slight murmur, but a maximum noise of 30.4 dB(A) during idle is hardly audible. The notebook reaches up to 36.4 dB(A) if you play games or use very complex applications, but this is still pretty quiet. The successor IdeaPad Flex 14, the Lenovo Yoga 2 13 or the Acer Aspire R7-571G are louder, whereas the Toshiba Satellite W30t or the Asus Transformer Book T300LA are quieter with hardly audible fans. All the devices within the comparison were pretty quiet during operation, but there were also two models with the Lenovo Yoga 2 13 or the Acer Aspire R7-571G that were pretty warm under maximum load for the graphics card and the processor: The Aspire reached a maximum temperature of 51.7 °C at the bottom, so using it on your lap is not a very convenient experience. 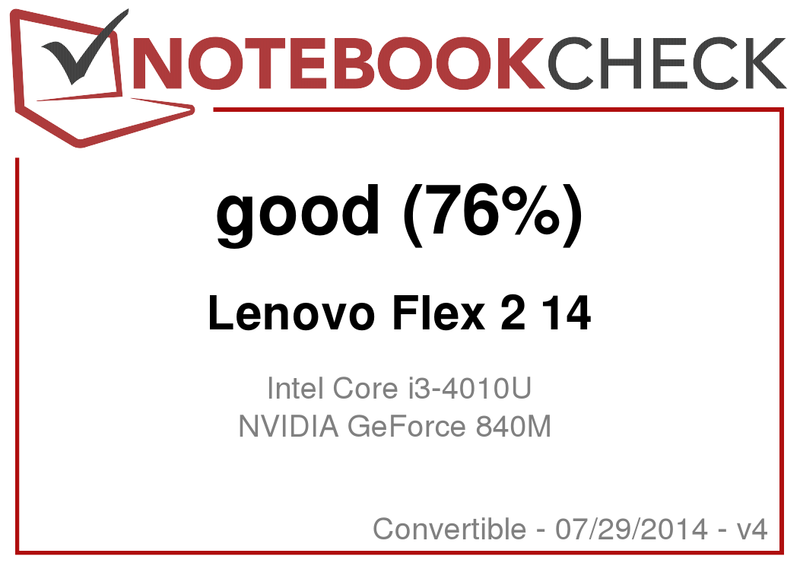 The Lenovo Flex 2 14 can be pretty hot as well if you stress it for a longer period: We measured up to 47.9 °C, which is not a convenient surface temperature. But similar to all other devices: The maximum load for the processor and the graphics card is a major exception. You can hardly feel any warming in practice and it is not bad during gaming, either. We measured up to 31.4 °C during idle. We simulated continuous maximum load for the GPU and the CPU with our stress test to see how the temperatures and the clocks develop over time. Fortunately, the temperatures of the two core components are never critical: We measured 70 °C for the GeForce 840M and up to 76 °C at the processor. The clocks under maximum load are slightly decreased for both components: The GeForce 840M cannot reach its maximum Turbo clock of 1,124 MHz, but the clock of 1,092 MHz is just slightly below that. 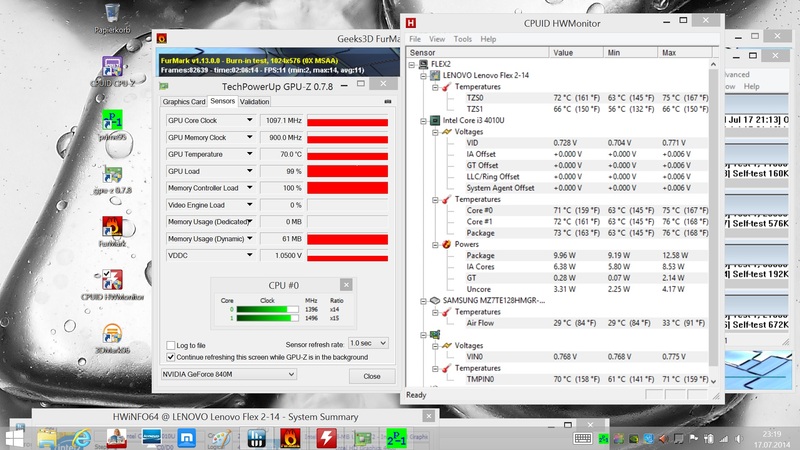 The CPU clock drops from 1.7 GHz to 1.4-1.5 GHz. Since the simultaneous maximum load for the two components represents a theoretical test and the differences to the maximum clock are very small, you can expect the full performance from the Flex 2 14 under load. 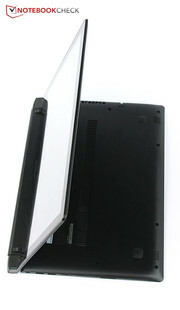 The speakers of the Flex 2 14 are underneath the front edge of the notebook. You can select different profiles for the sound with the Dolby Digital Plus software or use an equalizer to adjust the sound to your own preferences. All in all, the speakers are not too bad and actually sound a bit better compared to the IdeaPad Flex 14: The maximum volume is still pretty high, but there are no distortions. The speakers have a hard time creating a really differentiated sound with very rich pieces (singer, orchestra and choir), but you can still hear the individual instruments and the voices, which is not a matter of course for every notebook. The high tones are too rich and there is hardly any bass, but the overall sound is pretty balanced. Music and movie enthusiasts are certainly going to use external speakers for the long term, but the fact that there is only one stereo jack could be an issue, because you cannot attach a microphone beside the speakers. This also means you cannot use high-quality headphones with one connector each for the headphones and the microphone. The integrated microphone actually consists of two microphones, a so called dual-array microphone. This can help to separate background noise from voices, and the voice was actually very clear and the ambient noise pretty quiet in a short test call via Skype. Our review sample leaves a mixed impression in regard to power consumption: The 0.1 Watts when the device is turned off could be improved; most of the comparison devices actually don't consume any power. The stand-by consumption is also comparatively high with 0.3 Watts. The idle consumption is at the lower bottom of the comparison with 7.7 Watts on average, but the maximum idle value is a bit higher with 12.9 Watts. The average consumption under load is pretty average with 33 Watts because of the dedicated graphics card, just like the maximum consumption of 46.3 Watts. All in all, the consumption of the Lenovo Flex 2 14 is decent. The device does not break any new records in terms of power consumption, but it does not waste any power either when you consider the performance. Still, there is one unrivaled winner in terms of saving power: The Asus Transformer Book T300LA uses a surprisingly small amount of energy in every scenario, but it does not have a dedicated graphics card. Compared to the IdeaPad Flex 14, the battery of the Flex 2 14 is much smaller: Lenovo reduced the capacity from 48 Wh to 32.5 Wh. This can be a problem since the IdeaPad Flex 14 was already equipped with a processor from the Haswell generation and did not have a dedicated GPU. Unfortunately, there are no records of the IdeaPad Flex 14's consumption in our database, so we cannot make a direct comparison. However, the battery runtimes compared to the IdeaPad Flex 14 are on the same, pretty mediocre level if you don't use the dedicated graphics card: The Asus Transformer Book T300LA or the Toshiba Satellite W30t can sometimes even double the battery runtimes, but they always manage longer runtimes away from a socket. If you just write text or browse the web, the Lenovo Flex 2 14 does not manage a whole business day with 5:42 hours. The runtime when you watch a video is more practical with 5:02 hours, but it is still significantly shorter than the almost 10 hours of the Asus Transformer Book T300LA. The runtimes that Lenovo squeezes out of the admittedly small battery are practical, but other devices are significantly better nonetheless. Not as flexible as the Lenovo Yoga 2 13, but you save 100 Euros (~$134) in return. You can save the money if you don't need the Tablet-mode of the Yoga, otherwise, the two convertibles are very similar – the Lenovo Flex 2 14 has a 0.7-inch larger display and the device is half-a-kilogram heavier. 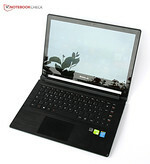 However, the Flex 2 14 is not really a successor of the IdeaPad Flex 14 since the differences are just marginal – not even the processor generation has changed. The case has grown a little in every dimension and the weight was slightly increased. The display is finally Full HD, but it cannot really be used outdoors and the viewing angles are not perfect, either. The battery is now noticeably smaller, but at least it does not really affect the battery runtimes. However, they were not really competitive for an ultra-mobile device in the case of the IdeaPad Flex 14 in the first place. A much more important advantage is the dedicated graphics card. The GeForce 840M is usually powerful enough for older or some current titles with medium settings, which might be sufficient for less ambitious gamers. Overall, the Flex 2 14 is a solid budget convertible, but you can actually notice the comparatively low price: Many details are not very sophisticated, for example, the position of the stand-by button or that there is just one USB 3.0 port. The low stability of the display and the metallic sound when you twist the base unit leave a cheap impression. If you can live with these drawbacks for this price, you get a well-equipped convertible for standard tasks that is equipped with a fast SSD, Gigabit-LAN and good input devices. Because of the scaling issues that affect many applications, we deducted one point from the final rating. The case of the Lenovo Flex 2 14 is made of plastic. 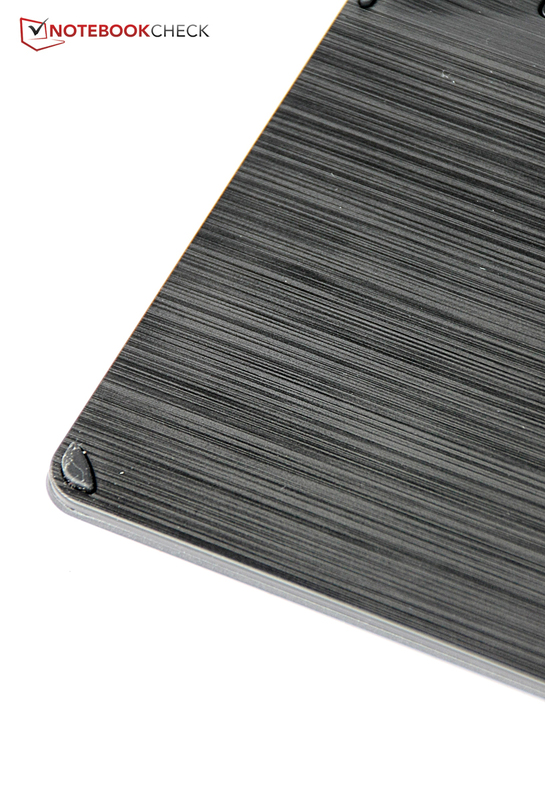 The surfaces are nice to touch, but the build quality is not always perfect. However, the overall choice of materials is convenient, especially when you consider the price. The hinge is the highlight of the concept of the Lenovo Flex 2 14. It can be opened by 300 degrees. You can, for instance, put the notebook on a table to improve touchscreen handling. The Tent-mode is available as well, even though Lenovo does not advertise it. You can obviously also use the Flex 2 14 as a common laptop. Only the completely flat Tablet-mode is reserved for Lenovo's Yoga-series. 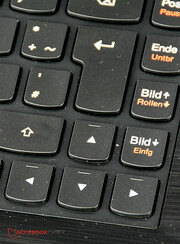 The keyboard is illuminated and is automatically deactivated depending on the mode. The touchpad is a ClickPad. The whole lower part can also be used as a button, which can lead to inaccurate inputs. The plastic around the keyboard has a brushed metal look. This looks sophisticated, but it still feels like plastic. The touchscreen is a decent input device, but it is very glossy, so it is quite tricky to use it outdoors. The special keys of the keyboard have priority. 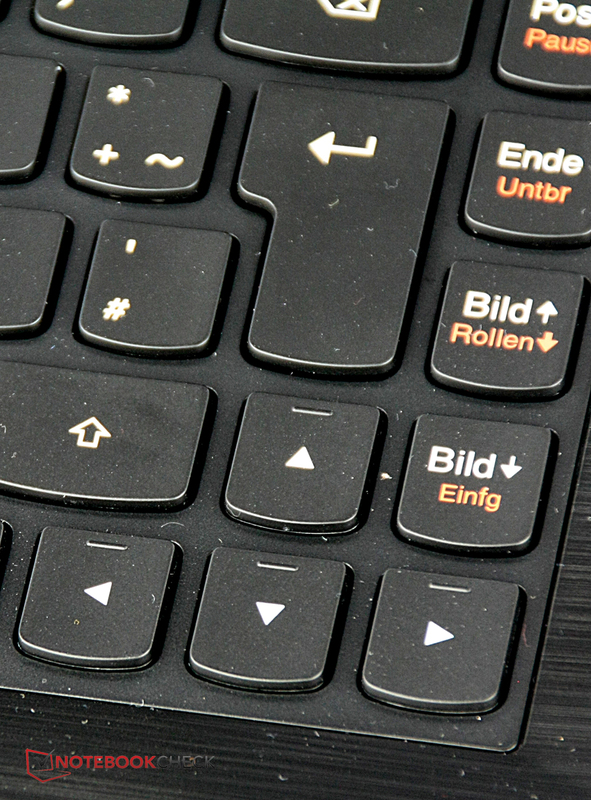 The arrow keys are pretty big for a 14-inch device, but they are not separated from the rest of the keyboard. Only one USB 3.0 port is a bit meager. The hinge can convince us: Firm enough but still not too heavy. 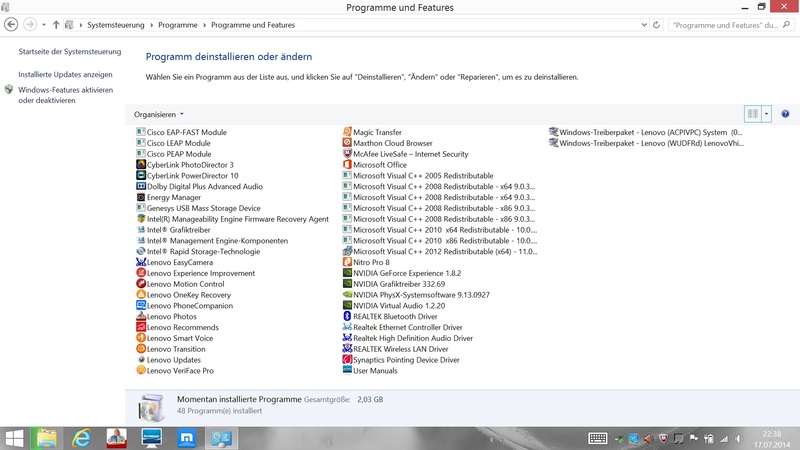 Lenovo installs some useful tools, but you also have to remove some bloatware. 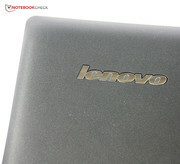 Overall a solid device, which would be even more convincing if Lenovo had paid attention to the details. The display in particular is worrying: Working or gaming is often complicated by scaling issues. However, you at least get a Full HD screen and Gigabit LAN this time. Still, the display is too glossy outdoors. These horizontal stripes can fortunately be fixed by a driver update, but not the scaling issues. The dedicated graphics card Nvidia GeForce 840M is sufficient for older and some current titles. The GeForce 840M is a powerful dedicated GPU for such an inexpensive and compact convertible. Another USB 3.0 port would have been nice, and the scaling issues of the Pentile display are annoying. That Lenovo manages to increase the size and the weight of the case, despite the smaller battery. Toshiba Satellite W30t, Asus Transformer Book T300LA, Acer Aspire R7-571G, Asus VivoBook S451LB, Lenovo Yoga 2 13, Lenovo Yoga 2 Pro.